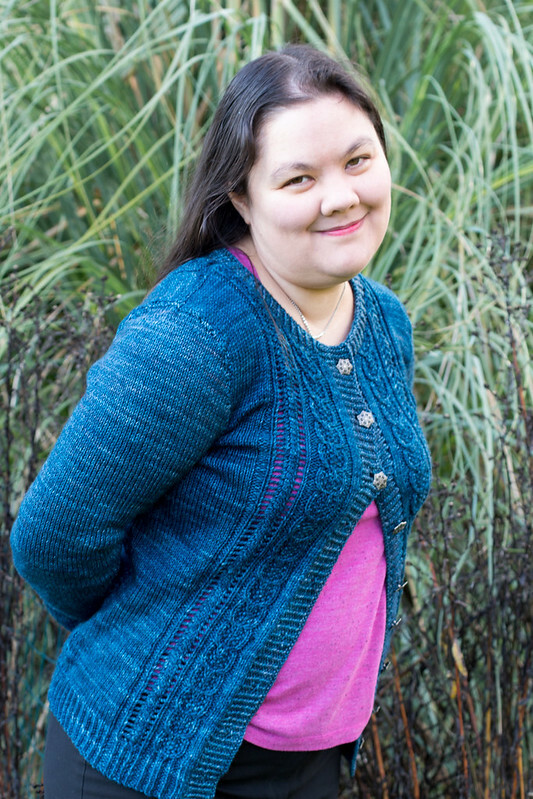 Remember this cardigan I started back in March? I almost made the Cardipalooza deadline in May, but abandoned it a bit shy of the deadline when I ran into problems and decided it would be better to take a break than to try to push for a deadline. 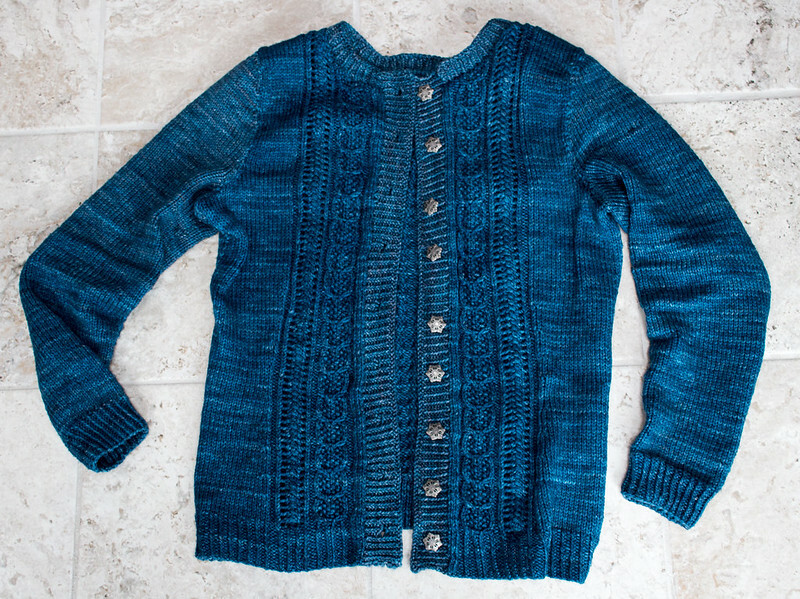 I picked it up again now that it’s finally getting cool again, and I finally finished it last weekend. The pattern is Acorn Trail. It’s a beautiful sweater, and I’ve found Amy Herzog’s sweater fitting books really interesting, so I was eager to try one of her patterns. With judicious use of a highlighter I didn’t even find the pattern too hard to follow despite the many possible adjustments. I did somehow make the body section longer than I intended and had to do a run for more yarn, but to be honest it’s a nice length and while you can spot that the last skein is slightly more grey if you look a the sleeve joins at the shoulder or in the button band, it’s not as bad as I first feared. 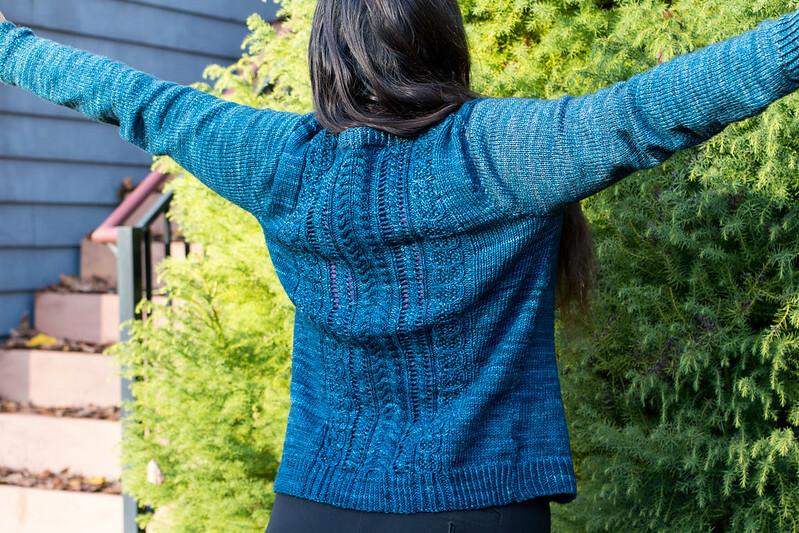 I thought I would prefer to do a pieced sweater because most of my knitting is on the go, and doing pieces meant I could still easily carry it around. But it turns out I’m not great at seaming and I don’t much enjoy it, and even while I was knitting I spent time wondering why I was making seams when I could just put things together in 3d in the first place. In the end, I *did* convert the sleeves to be knit in the round rather than flat because I couldn’t honestly think of any reason not to do so, but I did the rest of the pattern as written. 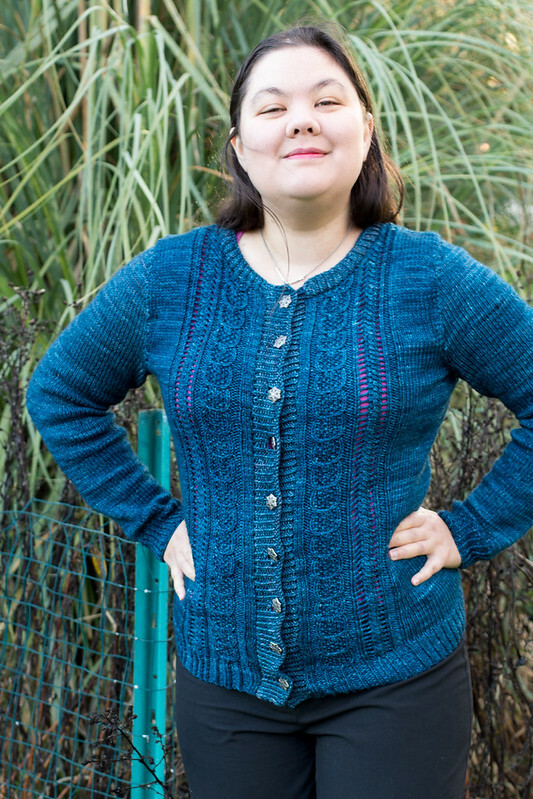 Still, I found I was constantly sad I couldn’t try it on as I went and adjust it all more precisely, so I think next sweater I try may be a more seamless affair and probably top-down. The current leading candidate is Lush, but something else may well catch my eye before I get to making it. I’m guessing right now it’ll be after the 2017 Rose City Yarn Crawl before I’ll have time for a sweater again. 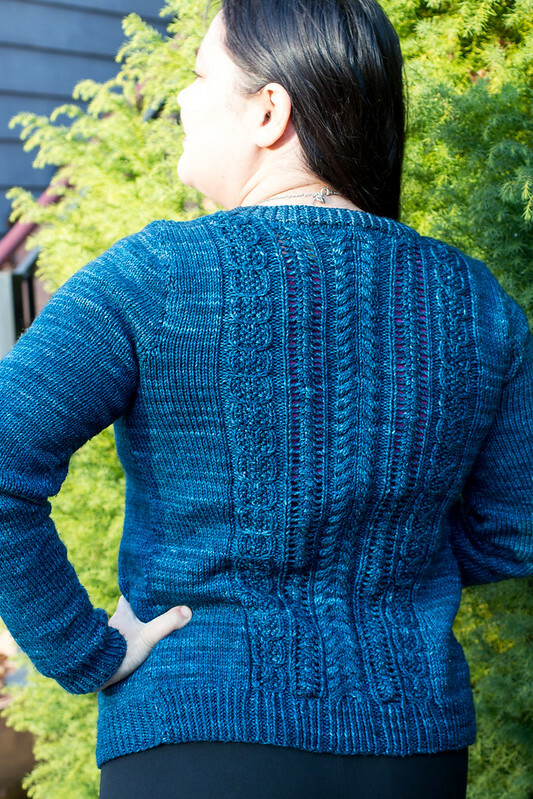 The yarn is Malabrigo Rios in Bobby Blue, which I picked up from For Yarn’s Sake. That was the first yarn store I visited when I moved here, I think! It’s very conveniently located next to the woodworking store in the same mall as the chocolate shop. The yarn is soft and lovely and washable. I would totally use this again, although maybe not for a sweater since getting enough in one dye lot was hard even with For Yarn’s Sake’s fairly large collection. I did stripe it to even out the dye lots, but that last skein is still noticeable to my eye. The colour did bleed a bit when I washed and blocked it, but nothing dramatic, just enough that I’ll be careful if I decide to use the remainder in some colourwork. The buttons I picked up at Black Sheep at Orenco, and aren’t they cute? 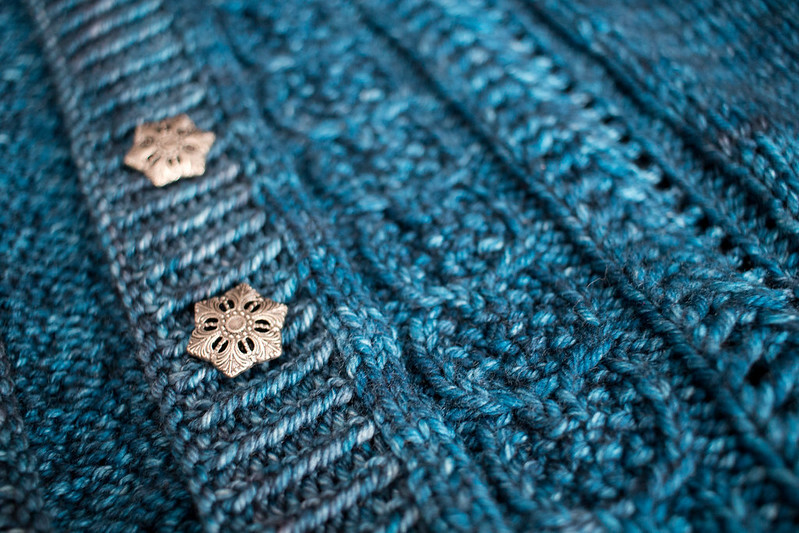 They’re probably a bit impractical since star buttons can be kind of finicky in knitting, but I liked the look of them and honestly, I mostly wear my cardigans open since work is pretty warm for sweaters. Although it did snow this week, so it’s cool outside! Many of my knitwear photos are self portraits since my husband’s photographic passions are more about architecture and landscape than people. (I on the other hand, am mostly about people and flowers.) But he was kind enough to help with these and as always, the two of us working together results in much funnier expressions. He did a really nice job, although I cheated and gave him a 50mm prime lens so he had no choice but to be a bit more close up than he normally would be. So that’s it! I’d guess that the sweater was under 2 months of work in total, but with a 6 month gap in the middle. Honestly, I thought it would take me longer! I’m pretty proud of my first me-sized sweater, and I’m sure it’ll be the first of many. 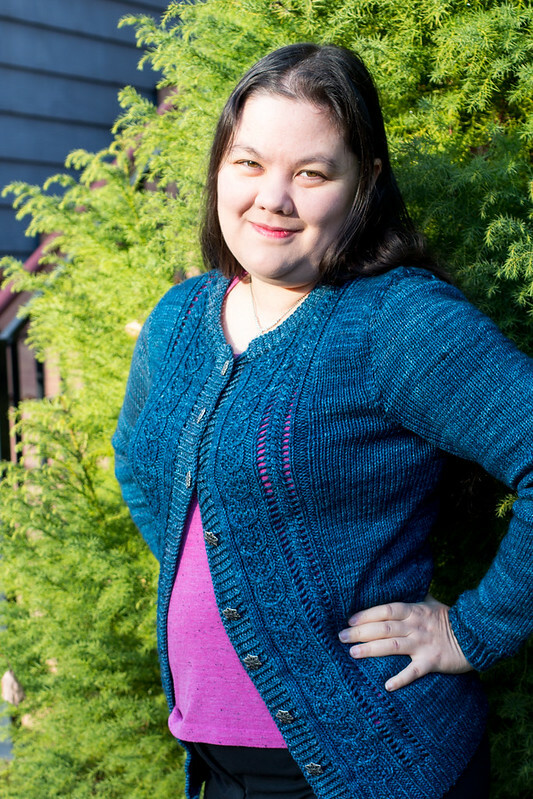 This entry was posted in knitting, wearable. Bookmark the permalink. What a great sweater and what an awesome achievement. And I particularly love the pride in your stance in the last photo! Beautiful sweater! You did a great job. And it’s hard to match Malabrigo, even *within* dye lots. But I love it anyway.